Don’t like Instagram’s icon? This app lets you change it and any others on your phone. You can customize the outside of your phone, so why not the software that runs on it too? That’s the premise of Cocoppa, a service that lets you tweak the icons, look and feel of an Android or iOS device to your heart’s desire. The company has racked up an impressive 25 million downloads to date. That interest has largely stemmed from its native Japan, but it is increasingly finding popularity in the US, where it intends to increase its focus. 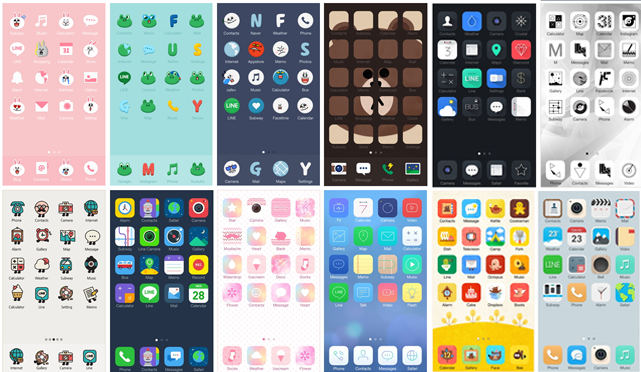 Cocoppa provides alternative app icons, wallpapers and home screens for its users. It includes content licensed from movies, cartoons and more (most of which is not free), as well as content created by Cocoppa users themselves. Beyond wallpapers and screen savers, Android users have more options on Cocoppa because the Google-owned platform is open to a greater level of customization and tweaking. However, iOS users can also change the app icons on their device. That’s because Cocoppa found a method that overcomes Apple’s rigidity by allowing devices to house shortcuts to apps. Essentially you download a tweaked Instagram icon, for example, and then hide the original away in a folder or elsewhere — because deleting the original would remove the app from the device. The new icon is basically just a link to the app, so while you can pretty it up as you like, it will take a second or two longer to load, which is frustrating. Thanks to user-generated content, Cocoppa offers a staggering collection of more than six million icon designs and over one million wallpapers. That’s a lot of options for you if you want to go wild. I started out wanting to change my Instagram icon because, well, why not? To get customizing, open the app and search based on either the name of the app you want to redesign, or specific colors, tags or categories. When you find the one you want, just hit download. Many icons come in packs, which is an easy to way to get a color-coordinated look for your phone. As you might expect, the app is particularly popular with teen girls. Cocoppa CEO and President Naka Imuta told me that the average global user is female. That’s something that strikes you the moment you open the app and see the suggested themes, content and layout. Imuta said that the US accounts for 33 percent of all downloads, which actually makes it the largest market globally. But Cocoppa is planning to increase its focus on the US nonetheless. “Japanese users spend more, perhaps because most of the content is more focused on Japan, but we are planning to expand towards more US content this year,” he explained, before revealing that US-focused music artist and celebrity themes are being prepared. So how active are users? Most tend to change their themes once or twice a month, Imuta said, although “heavy users” will tweak their customizations daily. Teens don’t spend as much money as older users, he explained, but young users are more likely to buy premium and licensed content than older users. Cocoppa got some big-name competition earlier this year when Line, the Japanese messaging app with nearly 500 million registered users, introduced its own Deco service aimed at replacing boring app icons. Contrary to being concerned, Imuta said that Line’s move into the space validates Cocoppa’s efforts. He believes that the service’s real strength is its community, which continues to create new designs daily, which Line doesn’t offer. Imuta also believes that the premium content makes Cocoppa the premier option for handset customization — even against Line, which has almost single-handedly pioneered the concept of stickers and linking with entertainment companies. Imuta didn’t provide any financial details — beyond calling the company’s revenues “hefty” — but I find the business fascinating. It is always interesting to explore trend and services which are popular among young people and exist almost totally outside the radar of the rest of us.